The countdown has begun! 2018 is almost over and it’s time to start planning your New Year’s celebrations. 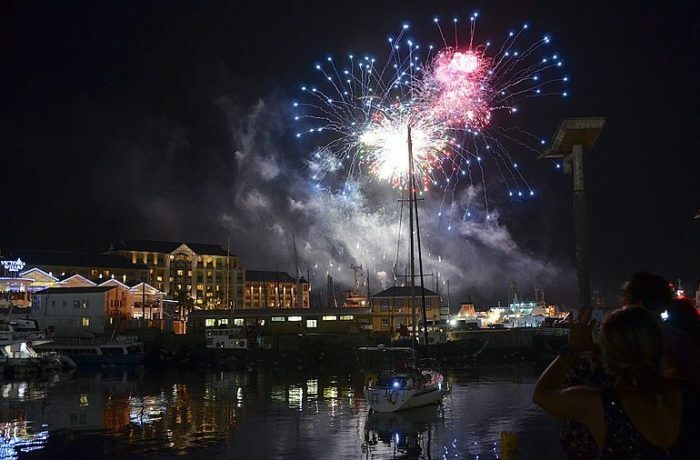 But Capetonians know that living in a city that is not only a world-class party destination but also filled with unique cultures and activities makes choosing how to spend New Year’s Eve pretty challenging. From concerts, cruises and comedy, to the more conventional kinds of New Year’s Eve parties, there are all sorts of ways you can bring in 2019 when you’re in Cape Town. It’s been a long year, so to give your brain a bit of a break this festive season we’ve handpicked a list of celebrations that are just as diverse and festive as our city and its people. If going big isn’t your thing and you’re looking for fine dining or family time this New Year’s eve or day, don’t worry, we’ve got you covered, too. Jeremy Loops is returning to Kirstenbosch to perform his New Years Eve show, which has become an annual affair, so much so that it has gained the tag #LoopsBosch. Bring a blanket and picnic basket to this concert on lush green lawns. Tickets are now on sale for R145 and can be purchased at px.jeremyloops.com/kboschnye. Note that all concert-goers need a valid concert ticket—this includes children under 6 years. The show will take place at Kirstenbosch Botanical Gardens on December 31 from 7pm. Gates to the concert area open at 7pm. Cape Town weather is infamously erratic, but no worries—Kirstenbosch concerts take place no matter the weather and irrespective of rain. Note that no refunds are issued due to weather. Legends in Concert is a celebration of music legends, all on one stage in one night, and features a talented 10-piece cast that impersonates every legend to perfection. Kicking off a with medley made in rock and roll heaven, the cast pays tribute to Little Richard, Jerry Lee Lewis, Elvis Presley, and Ray Charles, as well as stars such as Shirley Bassey, Nina Simone, Cher, Gloria Gaynor, and Lulu. Highlights of the show include a heart-rending version of “That’s What Friends Are For” – an homage to Stevie Wonder, Dionne Warick and Elton John – and a duet performance of the ballad “Endless Love”. The show also pays tribute to the amazing vocals of Meatloaf in renditions of songs like “Anything for Love” and “Bat Outta Hell”, and to Michael Jackson in performances of hits such as “Bad”, “Billie Jean” and “Beat It”. Other tributes include ones to Tina Turner, Freddie Mercury, Billy Joel, Cindi Lauper, Paul McCartney, and Billy Idol. Doors open at 7pm for the 9pm show start, with three sets and a countdown to midnight. Tickets to the show, at R400 per person, include entry to the concert, a fun surprise party accessory, a welcome drink, and a finger food buffet running from 7.30pm. Grab yourself a ticket to this entertaining, mind-blowing celebration of the music icons who rocked the world. You can pre-order or purchase on the evening. It’s nearly time for this annual shindig at the Cape Town Comedy Club on Monday December 31 at The Pumphouse at the V&A Waterfront. 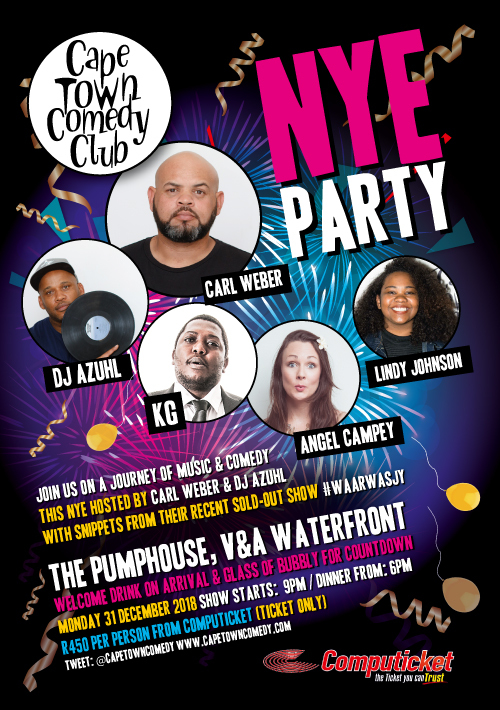 Join a journey of music and comedy hosted by Carl Weber and DJ Azuhl, who will both be performing snippets from their recent sold-out show #WaarWasJy, and featuring comedians Lindy Johnson, Angel Campey AND KG Mokgadi. The show starts at 9pm and doors open at 6pm. The ticket price includes the show, a welcome drink on arrival and a glass of bubbly for the countdown. Note that it does not include a meal. On the night, you can order from the Comedy Club’s A La Carte Menu and take advantage of its Happy Hour from 6pm-7pm. Tickets are R450 per person and available from any Computicket outlets or Shoprite or Checkers stores. You can book here at online.computicket.com. The seating arrangements in the 180-seater dinner theatre are handled by Cape Town Comedy Club and very often guests share tables with other groups. Seating requests can be considered but are not guaranteed as guest numbers may not allow for it on the night. If you have booked separately with Computicket and would like to be seated with your friends or family, email Cape Town Comedy Club a list of all the Computicket purchasers’ names so that they can try their best to group you together. However, they do go by the phrase “Share the laugh, share the table”. Laugh your way into the new year at Cape Town’s only dedicated comedy club, listed as one of the Top 10 comedy clubs in the world! Sometimes a beautiful view is all you need. Ever had dreams of sailing to sea? Sail out to Granger Bay and park off, party and watch the fireworks as you usher in the New Year out on the ocean. The cruise will include two glasses of champagne per couple and snack platters. A cash bar will be available on board. Time: New Years Eve at 9.30pm to just after 12am. Check in starts at 9.15pm. Take in the sunset over Table Mountain with stunning views of the Winelands while enjoying snacks on Klapmutskop, complete with a glass of bubbly to toast to the New Year. The hike takes you along a 9.75km marked circular route through the vineyards that starts at the Trail Centre located on Delvera Farm. It is a unique way to experience the Greater Simonsberg Conservancy and Yellowwood forest in the area. Hikers can arrive from 4.30pm. It takes up to one-and-a-half hours to reach the top, so don’t arrive later than 6.45pm —you don’t want to miss your chance to see the sunset at 7.51pm. A shuttle service will be available, provided especially for children. The hike from the shuttle drop-off point starts with the single track at the Pepper Tree – this shortens the route to less than 5km in total. This option takes about 30 minutes to the top. Hikers can be back at the Trail Centre by about 9pm, depending on walking speeds. Tickets cost R150 per person and R60 per child under 10 years. This includes the shuttle, a map, and a glass of bubbly, with juice available for kids. Picnics are available for R80 per person and must be booked and paid for at least two days before the event date. The menu options are available to view at www.dirtopia.co.za. Dirtopia Café will stay open until 10pm with food & drinks. Snacks and cool drinks will also be on sale at the Trail Centre. You also have the option of bringing your own food. Bring something warm to wear after dark and a torch. If you don’t have one, there is a selection of Energizer torches available for purchase at the Trail Centre. Remember to wear hiking shoes – you are climbing a mountain, so leave those slip slops at home. You are required to book a spot for this popular & special hike. You can book at 021 884 4752, [email protected] or www.dirtopia.co.za. The Trail Centre is open seven days a week 8am to 5pm with mountain bike trails and bike hire. Harald’s Bar & Terrace at Park Inn by Radisson will be hosting the Hawaiian New Year’s Eve Rooftop Party with Veuve Clicquot. You can look forward to rooftop views of Cape Town and Table Mountain while enjoying a live DJ, a welcome drink, loads of Hawaiian-inspired canapés, chargrilled braai tapas, and delectable desserts, as well as complimentary bubbles at midnight. Tickets are R895 per person. The Radisson RED hotel with be hosting its RED Roof #PartyInTheClouds NYE party on its rooftop this New Year’s Eve. Watch the sunset while listening to one of Cape Town’s finest singers, followed by party-starter DJs playing some slick South African-style beats. Tickets cost R2 100 per person, including a seafood feast and a welcome drink. Note that you must book and pre-pay to attend as no tickets will be sold at the venue and a limited number of tickets are available. You can contact the RED for menu options, bookings and enquiries. 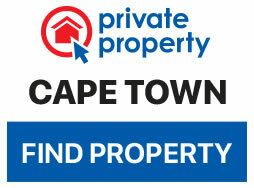 Remember that the weather in Cape Town can be unpredictable, so bring something warm just in case. Delicious food, 5-star service and the perfect, central location. If you’re looking for a spot to host your end of year function or private event – we know just the place! Thank you, @empowerme_events, for sharing this photograph of your recent event with us. For a classy NYE celebration, join the Pepperclub Hotel & Spa to ring in the new year with an elegant six-course dinner in the heart of the city. Feast on tempura tiger prawns, roast salmon and beef Wellington as you bid farewell to 2018 and welcome in 2019. Dinner is R975 per person for adults, and includes live entertainment, bubbly and a bottle of red or white wine per table. The cost is R275 per child under the age of 12, and includes sweet treats and soft serve ice cream. Another elegant NYE dinner party will be happening at the Commodore Hotel on New Year’s Eve 2018. You can look forward to enjoying a proudly South African dinner accompanied by live entertainment, hats and crackers. The cost is R995 per person and children under 12 years pay half the price. Dinner will be served from 7pm. Note that bookings are essential. If you’re not a night owl and would rather celebrate the dawning of 2019 during the daytime, chill out at Boschendal this New Year’s Day. Find a spot under the trees, open a bottle of bubbly and be entertained by DJ Dario. Boschendal is a family farm, so you are welcome to bring the kids along and let them play on the Werf lawns. There are hammocks and bean bags available to rent on the day, large shady oak trees and blankets. You are welcome to bring along blankets and camping chairs too if you wish. You can buy a farm picnic basket there, which will be filled with wholesome, artisanal treats from Boschendal’s own farm produce. Prices are R750 for a picnic basket for two and R425 for a basket for one. Kids under 10 can get a basket for one for R150. Live Bait will be hosting a New Year’s day event. Enjoy amazing beachfront views, great music, and Live Bait’s popular Saturday Hake & Chips special. Grab a Hake & Chips with a glass of wine, beer or ginger beer for only R89! There are not many better ways to spend your New Year’s Day afternoon than by the sea at Live Bait Muizenberg.